Customer experience has been on the rise during the last couple of years. From the traditional product-oriented businesses we’re moving towards customer understanding and customer-centric approaches. Whether you’re new to customer experience or coming for little inspiration, this is the right place. We have explained each term and definition and provided lots of extra sources, if you want to dive deep into the topic. Actionability is the result of analytics leading to concrete decisions and changes and actions within the company. Actionability is also, as we believe, one of the essential aspects of customer experience management. At the same time it is also what most companies are missing. How to take actions on customer experience? Actions include are short- and long-term follow-up. As short-term actions, you should be able to follow-up each individual responder, especially taking care of critical comments. Long-term actions are based on the analytics results of the customer feedback. Later, communicate the changes and improvements you’ve done based on customer feedback back to your customers. In both cases follow-up is a necessity, not a choice, if you want to build strong relationships with your customers. Only after you have acted on feedback, customer experience processes are developing. Artificial Intelligence (AI) is still the same old good AI, but now it’s brought to the customer experience field. According to Accenture, 85% of customer interactions will be managed with AI by 2020. The most important AI technologies relevant for analyzing customer feedback fall in the area of natural language processing (NLP) and machine learning. Both groups of technologies can be utilized to make analytics more actionable. With AI, you can get answers to most of your “why” questions. Why is NPS® going up or down? Why are your customers turning away from you? Why is the retention of your customers so high/low? But machine learning technologies can also help you to move from diagnostic to predictive analytics: if I fix this issue in my customer experience, how much will my churn decrease? If we make a decision to invest less on customer service agents, how much will it decrease my customer satisfaction? By the way, did you know that Lumoa’s analytics is powered by AI? B2B Customer Experience is, simply put, the experience and interactions with your company of a B2B customer. The situation when B2B CX was very distant from B2C CX has been rapidly changing. Now at least 80% of B2B buyers now expect the same buying experience as B2C customers. We’re moving towards personalized omnichannel experience in B2B customer journeys. B2C Customer Experience refers to how a B2C customer perceives his buying experience and further interactions with your company. Same as with B2B customers, B2C customers expect consistent and personalized omnichannel experience. Brand experience is how you design, see and want your customer experience to be. Brand experience is a very close concept to customer experience, except the latter refers to how customers reflect on your company. Customer churn happens when a customer/subscriber stops doing business with a company. Customer churn is the opposite of retention. So why should you care? Customer churn is a critical metric because it is much less expensive to retain existing customers than it is to acquire new customers. Although customer churn might be calculated in different ways, generally the practice is to count the total amount of lost customers, percentage of lost customers or lost business value within specific time range. The optimal way to reduce customer churn is to improve customer experience. Although it might sound hard to implement, in reality, there're modern tools which can help you with that. "Tips from 32 CX Pros how to reduce customer churn" by NGData. Customer centricity refers to customer-oriented culture in the company. The essentials include the shared targets, shared understanding and the voice of the customer program implemented across the organization. Secure the executive support: customer experience transformation is set up from the top. Secure the support of the C-suite executives since Forrester stated "Every successful transformation we studied began with a customer experience epiphany by a CEO or COO." Build a cross-functional CX team: get the key players from the whole company (chief executives, heads of departments) onboard CX transformation. Create a shared understanding: create a shared vision and targets for the whole company to follow. Share data and results of the customer experience analytics in an easy to use tool. This ensures that there is a shared understanding of what matters and the company can shift from rumors and opinions to fact-based decision making. Involve all the employees in the transformation: motivate the employees of the company to deliver great customer experience. Include customer centricity into daily operations and communications inside the company. Build CX into the culture: build a long-lasting principles oriented on customer success. Support consistent employee trainings, add customer centricity into the principles and mission and involve cx training in the onboarding program. "7 Secrets Of Building A Customer-Centric Company Culture" by Micah Solomon. Customer Experience refers to how customers perceive their interactions with your company. Customer experience is constructed in a direct or indirect interaction with your company but it always involves the subjective response of the customer. Therefore, you can never fully determine it. "It's all of the steps a buyer takes to get and use a solution from the time of the buyer’s realization of a need until the buyer deems the need no longer exists." – Lynn Hunsaker for ClearAction. "It's the perception the customer has of your brand." – Blake Morgan for Forbes. "It’s every contact the customer has with your people, your product and the way it is delivered. It includes service, packaging, the actual product itself and more." – Shep Hyken for UserTesting. According to Temkin Experience Ratings (2017), there are four key competencies businesses must sustain to achieve long-lasting customer experience success. "The Value of Customer Experience, Quantified" by Peter Kriss for HBR. Customer Experience Management (CEM, CXM) is tracking and understanding your customers’ experience, acting on that understanding and closing the loop with the customer. Gartner defines it as "the practice of designing and reacting to customer interactions to meet or exceed customer expectations and, thus, increase customer satisfaction, loyalty and advocacy". CM strategy in the company could be decided into 6 components defined by Bob Hayes for CustomerThink. Bringing all the components into one centralized system is what defines proper CEM strategy. Do you love CEM as much as we do? Check these awesome graphs to understand it better. Customer Satisfaction, or CSAT, is a broad term that describes many different types of customer surveys. The surveys are usually sent to customers shortly after an interaction with a company is complete, for example, after a customer has contacted customer support. This type of survey is a great way to close the loop on a customer interaction and make sure that you’ve met their expectations. That's a very typical design of a CSAT survey. Image by Retently. To summarize, CSAT is a very good tool if you want to measure how a customer is satisfied with one-time interaction. CSAT can also easily adapt to the particular needs of your organization. However, if you want to measure loyalty and aim for long-term goals, check the Net Promoter System. Detailed difference between CSAT and NPS. Customer service, or customer support, is often mixed up with customer experience. Although both concepts are related to customers, customer service is just a part of customer experience. Customer service is the actual assistance or advice provided by the company to people, who want to use or are already using the product/service. According to LivePerson's Connecting with Consumers report, 83% of customers needed some kind of support during their online journey and at the same time Groove mentioned that 82% of customers leave a company because of a bad customer service experience. Was the Customer Able to Find What They Were Looking For? That's right, efficient customer support could drive your customer experience to the skies, boost the retention rates and decrease customer churn. Customer feedback is customers' opinion about your product. Customer feedback helps you understand what drives your customer satisfaction rates (or impact factors*), and simultaneously, understand revenue drivers and reasoning behind customer churn and retention. *Impact Factors is what drives your customer satisfaction up and down. 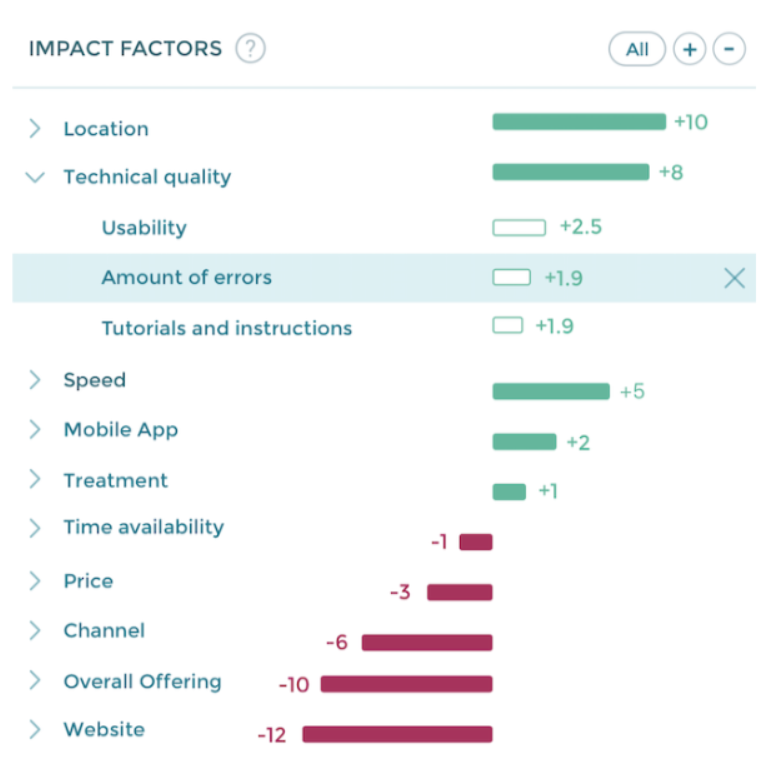 Impact Factors are the essential part of Lumoa, a tool for actionable customer feedback. Here's a simple detailed guide on how to collect customer feedback and how to act on it. A customer journey, also called buyer's journey, is a complete individual experience with your brand. The journey includes all the touch points and engagements that an individual has with a brand. To borrow a definition from Forrester, "The customer journey spans a variety of touchpoints by which the customer moves from awareness to engagement and purchase. Successful brands focus on developing a seamless experience that ensures each touchpoint interconnects and contributes to the overall journey." For more information, check "What is the customer journey and why does it matter to your business" by SurveyMonkey. A customer journey map is a visual representation of every interaction and activity a single customer might have with your brand. It gets complex because there're multiple channels and ways customers might come to your brand. No doubt you want to make every customer experience as great as possible. The process of creating a customer journey map will help you focus on the voice of your customer and listen to their wishes and needs. Check the video below from UX Mastery to understand the basics of customer journey mapping. Don't miss 5 Ways to boost CX using customer journey maps by Feedbackly to find out why you need a journey map . Most of customer journey maps focus solely on customers. Use this free customer journey map template by Columbia Road to understand a customer journey and develop business goals at the same time. Customer Lifecycle is the process which every customer goes through: from considering, purchasing and using to maintaining loyalty to a product or service. Customer lifecycle illustrated by Forrester. Unlike a customer journey, which is a unique journey of an individual customer, a customer lifecycle is a process driven by a company. Multiple customer journeys can relate to the same customer lifecycle. Customer lifecycle is the company's own view on the phases the customer goes through. Customer journey is a unique decision path each customer goes with your brand. Each customer might have several journeys: decision to make initial purchase, decision to expand the purchase (add features, etc. ), decision to purchase a new product from your company. More on correlation of customer lifecycles and journeys is here. Customer metrics are simply measurements used to gauge the customer – whether for loyalty and retention, marketing or new product development. In customer experience, that means a measurement of the customer satisfaction and business value of customer experience development. Customer metrics are also referred as customer experience KPIs. There're different metrics used today and it is important to understand the needs of your business. A company usually follows a set of KPIs. What metrics should you follow? The beautiful thing about KPIs is however, that you should solely tailor them to your business. Properly integrated customer experience KPIs will expand their influence over the whole organisation and should be also followed by the whole organisation. Net Promoter Score, or often, NPS, is a numerical part of the Net Promoter System, customer metric. You have probably already seen it many times before. The Net Promoter Score is often called "The Only Number You Need to Grow". It is calculated with the key question is "How likely is it that you would recommend [your brand] to a friend or colleague?" using a 0-10 scale. Responders are groups into three categories: Promoters, Passives and Detractors. Promoters (who voted 9 or 10) are loyal and happy customers, who keep buying and referring others. Passives (who voted 7 or 8) are satisfied but not enthusiastic customers. Detractors are unhappy customers who damage your brand by spreading negative word-of-mouth. The Net Promoter Score is the calculated difference between the percentage of promoters and the percentage of detractors and could vary from -100 to 100. Although the higher the score, the better, the score of 100 means that there's not a single detractor in your company which is a very unrealistic goal. When setting up targets for the Net Promoter Score, you should think of three aspects. The score should be above 0. Having a positive score means you have more promoters than detractors. Aim at the score higher than the previous score you got. Improve customer experience, focus on the positive features (according to your customers) of your service/product and eliminate negative behaviours. Compare your score to industry standards (by region, country, industry). London School of Economics has found a correlation between the score and revenue of the company: an average NPS increase of 7% equals 1% growth in revenue. It makes the Net Promoter Score a very simple and powerful metric, yet almost meaningless alone without the whole Net Promoter System in place. Net Promoter System, or NPS consists of the Net Promoter Score and open text feedback. In Lumoa, we’re big fans of NPS because it’s short and simple, yet provides all the information you need to proceed with customer experience. NPS typically has a very high correlation with retention: the happier the customer, the more loyal they are and therefore the more revenue they generate for you during their customer lifetime. most common mistakes and how to avoid them. Omnichannel is a cross-channel sales approach that provides the customer with an integrated customer experience. Omnichannel offers a consistent, personalized experience for consumers across all channels and devices with the main goal to make the customer journey as easy as possible, and that means consistent engagement no matter where or how they interact with you. No doubt, omnichannel communication is a definite megatrend of the customer experience in the next years. In the Forrester report "Building The B2B Omni-Channel Commerce Platform Of The Future", it was stated that omnichannel experience already plays a crucial role for both B2B and B2C businesses. Onboarding is familiarizing a new customer with the service. Often, we relate the onboarding with SaaS companies, when talking about onboarding, but it's not a necessity. In SaaS business, however, onboarding has become a very usual practice. It warms up the relationship between your brand and the new user, yet at the same time educates them and increases engagement. A user, who has gone through thoroughly-planned and beautifully-designed onboarding process is more likely to stay and become a loyal customer. SaaS onboarding might be a complex activity, but it doesn't have to include everything. 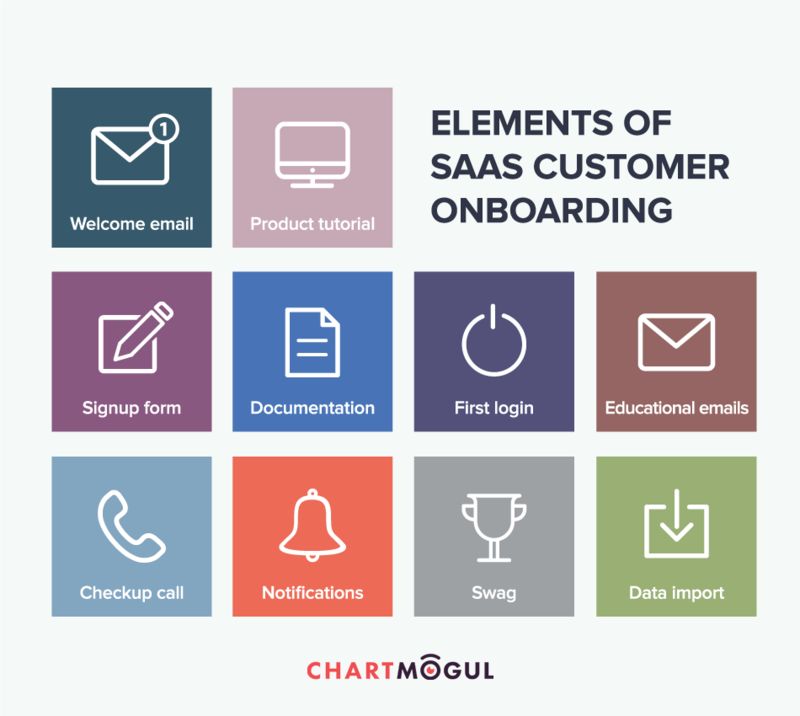 According to ChartMogul, onboarding starts from the first sign-up and welcome email and goes all the way to first login and engagement. Make your tool a playground and explain the rules of the game. Still, make sure it's personalized and consistent, yet very simple experience. To get started, check this detailed guide to SaaS onboarding. "The 5 'Best' User Onboarding Examples" by Appcues. Personalization means providing a customer experience which is tailored to the individual's consumer preferences and specific needs. Personalization comes in all forms and shapes: targeted advertising, tailored solutions. For example, if you buy a toy for a toddler from Amazon, the next time you log in to the system, it will show you similar products that might interest you. You might think that personalization raises a very important topic of personal privacy. Where is the border between "check this out, is this what you're looking for" and "we're watching you"? In fact, if done properly, personalization is an asset. According to Marketo, over 78% of consumers will only engage offers if they have been personalized to their previous engagements with the brand and, according to Accenture, 75% of consumers prefer brands that not only recognize them by name, but also recommend options based of the past purchases and know their purchase history. Consumers are asking for personalized experiences. Now personalization is expected not only for retail businesses, but across all the industries, both B2B and B2C. Get inspiration from these 7 personalized marketing examples from Hubspot. Customer retention is the measurement of how a business retains customers over a specific period of time. High retention rates is what you should aim at, since retaining customers costs less than acquiring them. If it doesn't make you to work on your retention strategy just yet, think about this: loyal customers are 5x as likely to repurchase, 5x as likely to forgive, 4x as likely to refer, and 7x as likely to try a new offering according to Temkin Group. Start learning how to your improve customer retention strategy and find 22 new ideas from this amazing blog. You might be wondering why social media is on the list. Social media is a powerful tool when it comes to customer experience. Social media could not only be used for customer support, but should be used to actively advocate your brand. After all, a satisfied customer is the best advertising you can have. Text Analytics (text mining) includes a set of techniques that structure information arriving in text format— for instance free text customer feedback. The purpose is to convert unstructured text into meaningful structured data to support business analysis and decision making. Topic analysis reveals topics that are most talked about. Example of text analytics with sub-categories. Do you see what drives customer satisfaction? Text analytics helps you to understand the drivers of customer satisfaction. The analytics is actionable, if it supports decision making in an optimal way and if the results of the analytics can be shared in a way the organization is empowered to act. A customer touchpoint is any interaction a customer has with your company. Touchpoints are not channels, but rather each individual activities of a customer. Touchpoints are also what a customer journey consists of. "I have a need. How do I find your company?" "I have a question. How do I contact customer support?" "I want to unsubscribe. How do I cancel?" You should know all the touchpoints in order to create a detailed customer journey and be able to improve customer experience across all the channels. Voice of customer, or VoC, refers to customers’ feedback about their experiences with and expectations for your products or services. Right now, you have more VoC data than ever – it comes in the form of user behaviour data, recorded phone conversations between your frontline staff and your customers, direct customer feedback, discussions in social media and even more, largely depending on your business. Voice of customer is not only about how to gather the customers’ feedback, but how to analyse and most importantly, act on the feedback. Decide on where to ask –you need to decide both on when to ask during the customer journey and which channels to use. Use analytics that provides you insights and enables you to make decisions. Perform improvement actions in the organisation. Rate the success of your customer experience development. Embrace customer-centric culture into daily operations. This simple process, when done properly, will help you to hear your customer, act on customer feedback and improve customer experience in a consistent sustainable way. Was this article useful? Is there a customer experience topic you want to hear more about? Did we miss an important concept? Let us know in the comments!